The raw material: semi-detached house built in 1974 facing north to the rear. The family: 2 adults and 1 child aged 1. 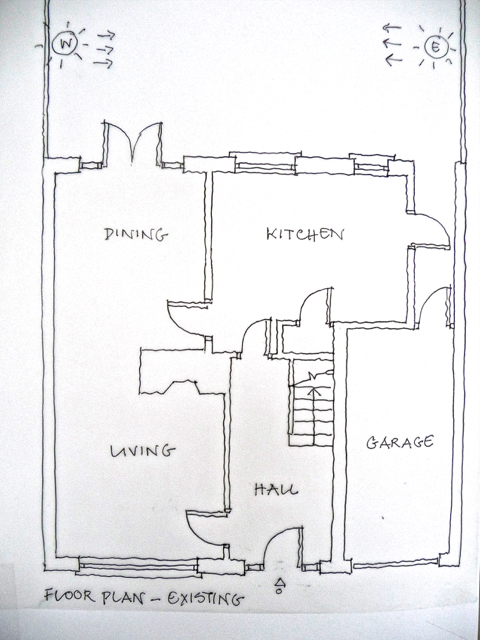 The brief: how to create a rear extension of maximum 36 square metres to accommodate a Kitchen/Dining/Family Room and to include a Utility and Guest WC. And how to resolve the relationship between the Living and Dining Rooms? The Raw Material: My thoughts on the Existing Plan.. The rear of the house gets no direct sun and is too fragmented for family living. The Dining and Living Rooms have an unusual relationship: the dining feels like a passage between the Living Room an Kitchen. The location of the fireplace in the Living Room, and the big opening between the Living Room and the Dining Room, makes the Living Room difficult to furnish and to relax in. Provide 4.6 x 4.2M rear extension for Dining Room positioned so as to face West, allowing evening sun to enter. Create new Family Room in old Dining Room. Extend this room by re-locating wall between this room and kitchen. 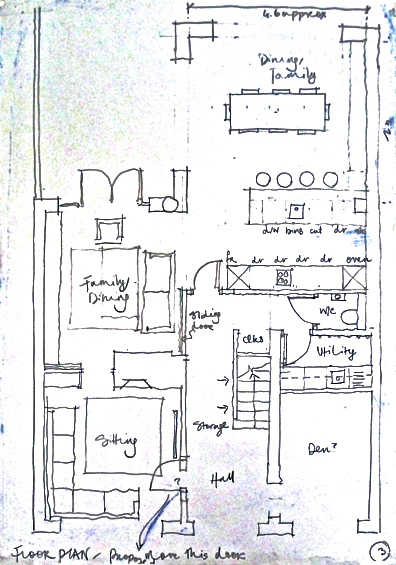 Locate kitchen in “knuckle” between Dining and Family Rooms with island unit between kitchen and dining areas. Provide large sliding screen between Kitchen and Family Room. Extend Hall, locate Guest WC and Utility off Hall with Coat storage at back of stairs and in pull-out storage under stairs. Provide “pocket” sliding door between Family Room and Living Room forming book storage to Living Room. Provide “L” shaped couch to Living Room, re-hang door to improve access. Convert Garage to provide Study/Den at future date, if required, accessed off Hall.